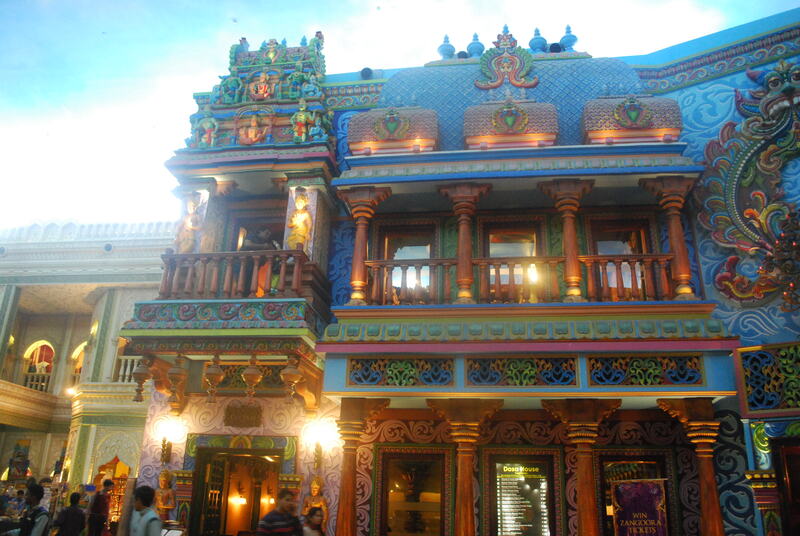 I had heard about the wonderful extravaganza that is the Kingdom of Dreams. I’d seen a few pictures and read some articles, but nothing in the world could prepare me for the experience I had. Let me take you on a journey. The entrance itself was glittering and golden. 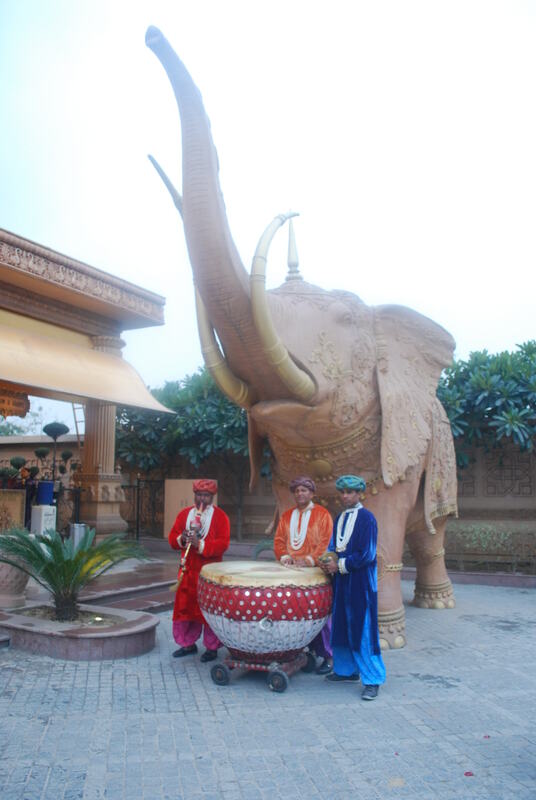 There were huge elephant sculptures, men in colourful clothes, and festive music. 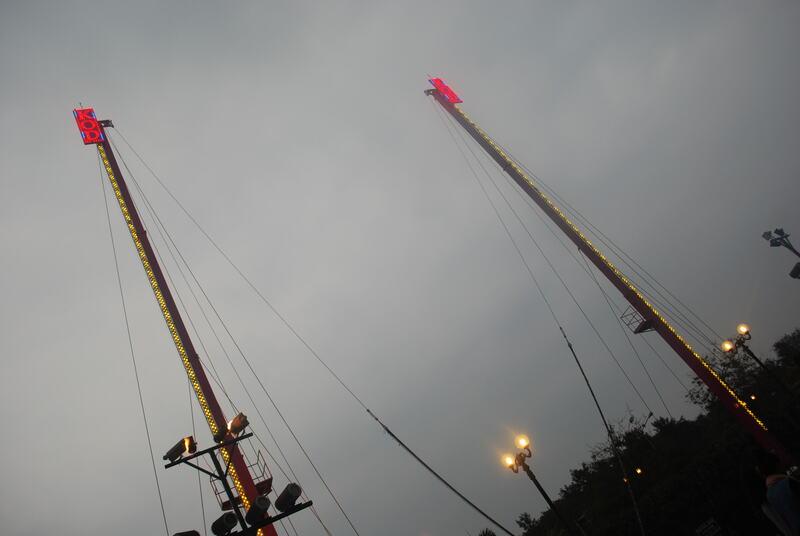 For the adventure junkies, there is a reverse bungee jump you can try. I was feeling like a chicken that day, so I decided to just enter the main building instead. 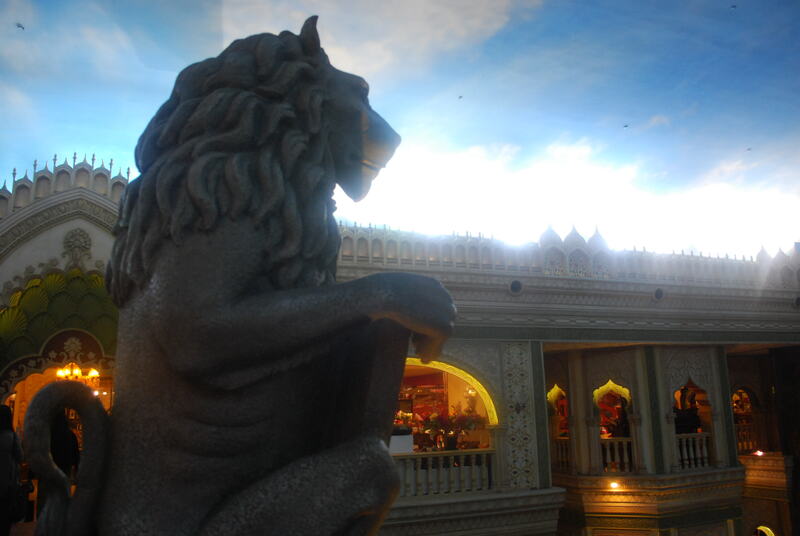 The Kingdom of dreams is a celebration of all things larger than life. Everywhere you lay your eyes, there is something impossibly beautiful looking back at you. 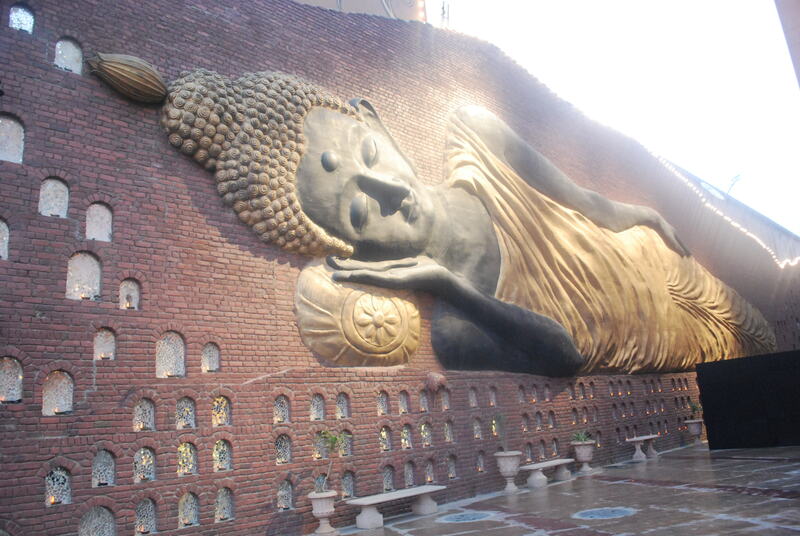 Like this serene Sleeping Buddha, that reminded me so much of the one in Thailand. 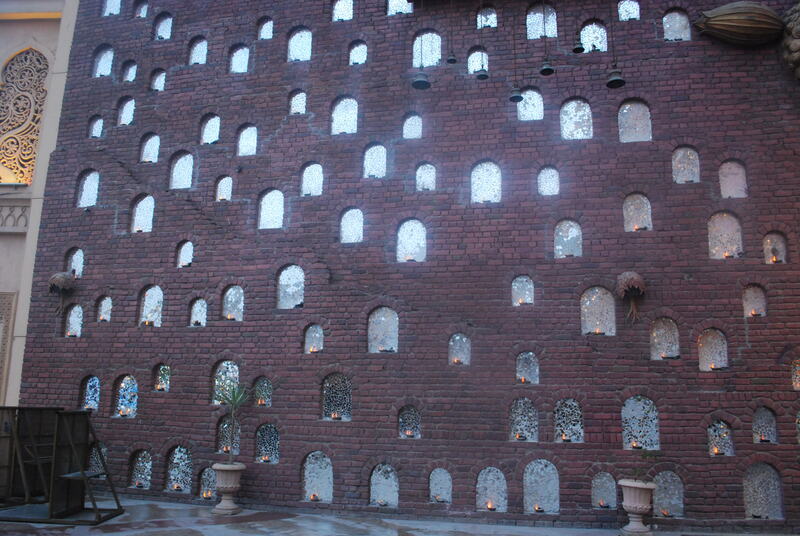 Or this wall of reflecting mirrors that catch the light in the most delicate, dreamy way. 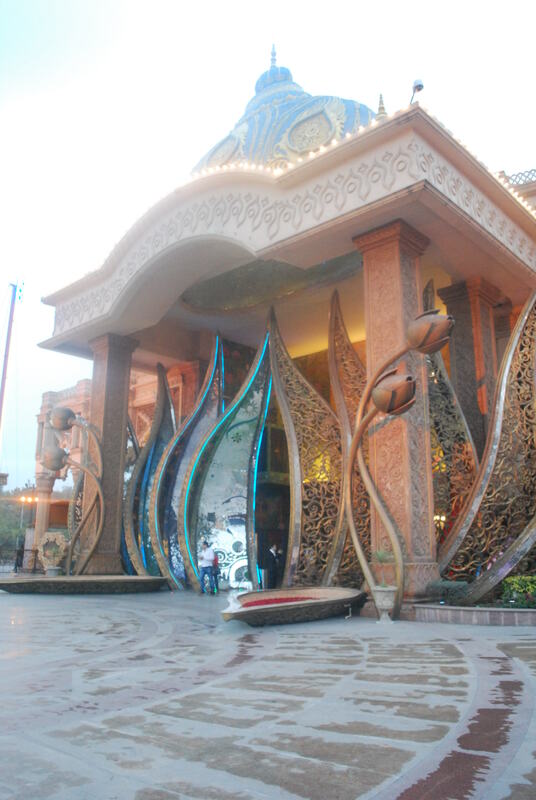 Take a look at this bejeweled entrance. You can see the thought in every little detail. The Culture Gully was my favourite section. It is, very simply, where the food is at. 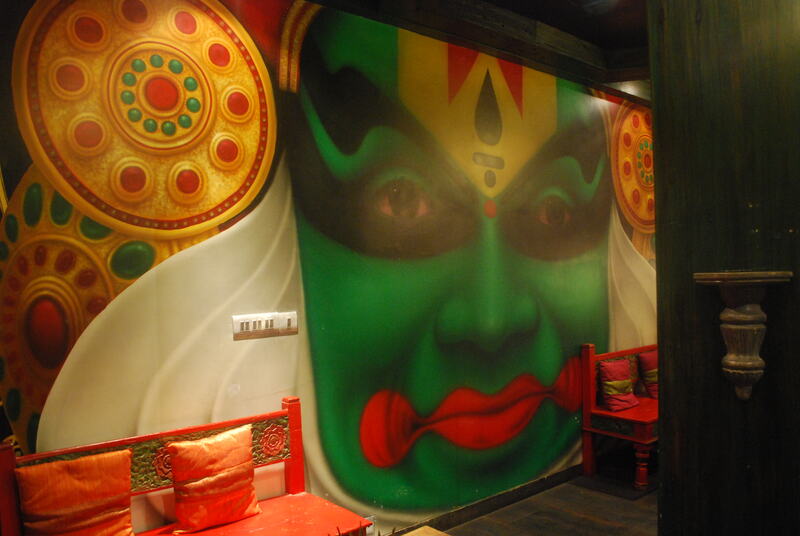 You’ll find a restaurant representing almost every state in India, and it’s impossible to not find something you’ll love to eat here. Decorated to showcase the culture of the region, each restaurant also has a shop where you can buy trinkets and curios that you’d traditionally find in those places. Here’s Bengal. It made me homesick. 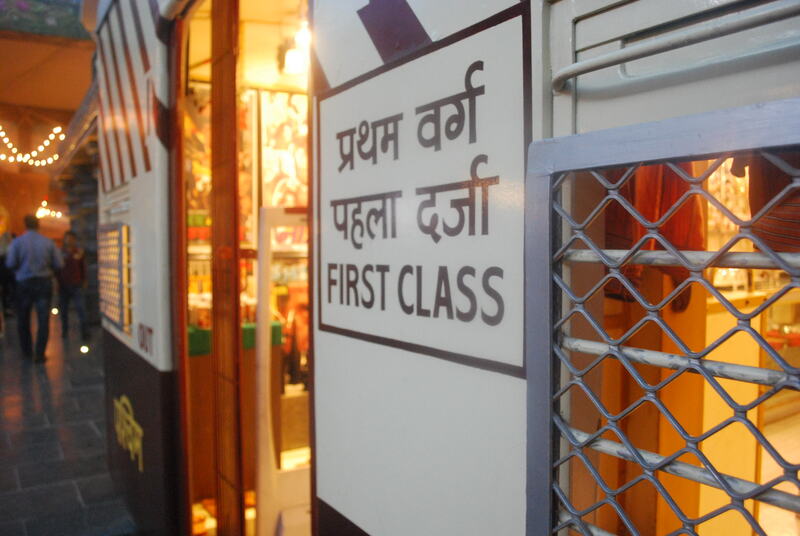 Bombay had a local train motif going, which I loved. 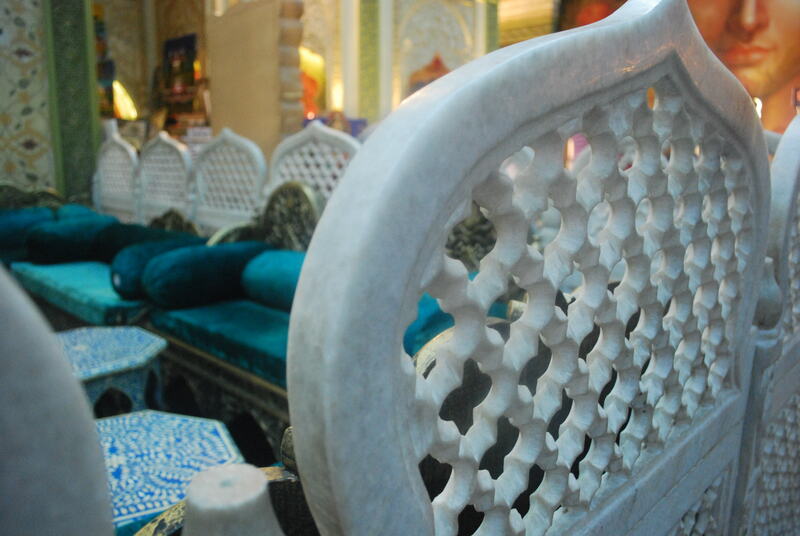 The interiors were even more stunning. 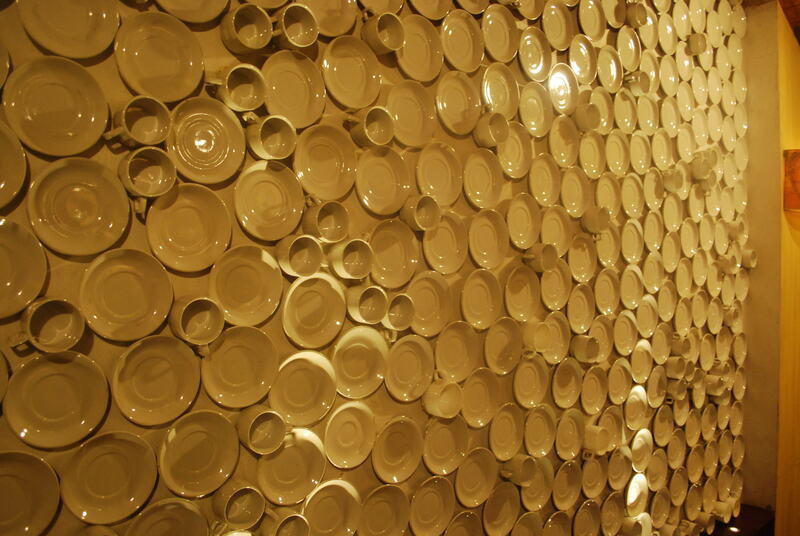 A wall of cups and saucers in the Assam section. Perfection! There are also some fun activities to indulge in like face reading, palm reading, and foot massages! 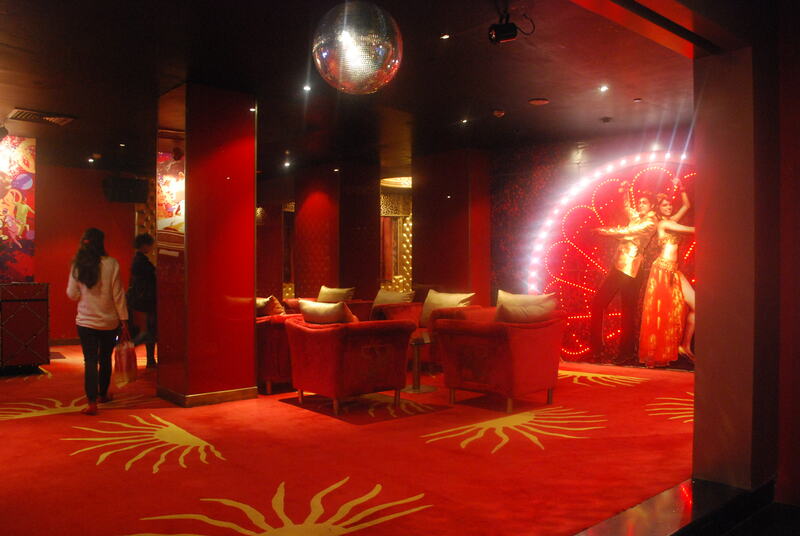 We checked out this very cool Bollywood Lounge bar with huge movie posters, and lots of red carpet to walk around on. 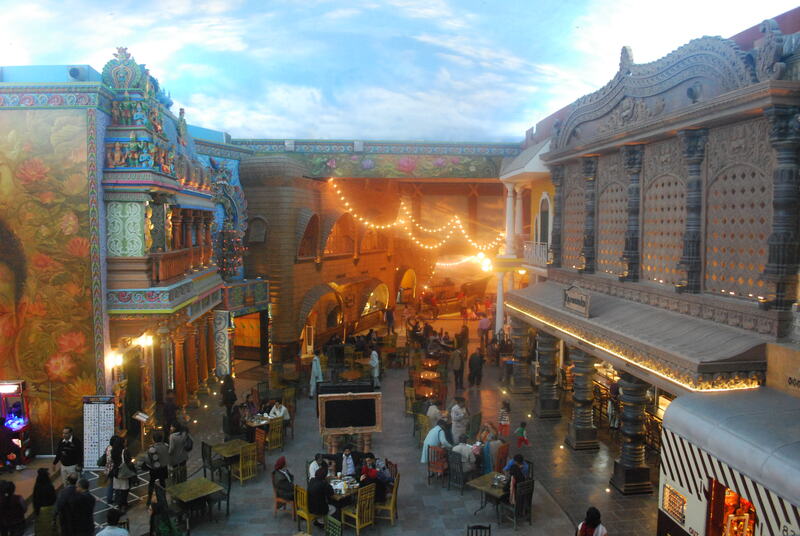 The whole Culture Gully area is covered with a false sky – so any time of the day or night, it’s always a cheerful blue at Kingdom of Dreams. Here’s a look from above. 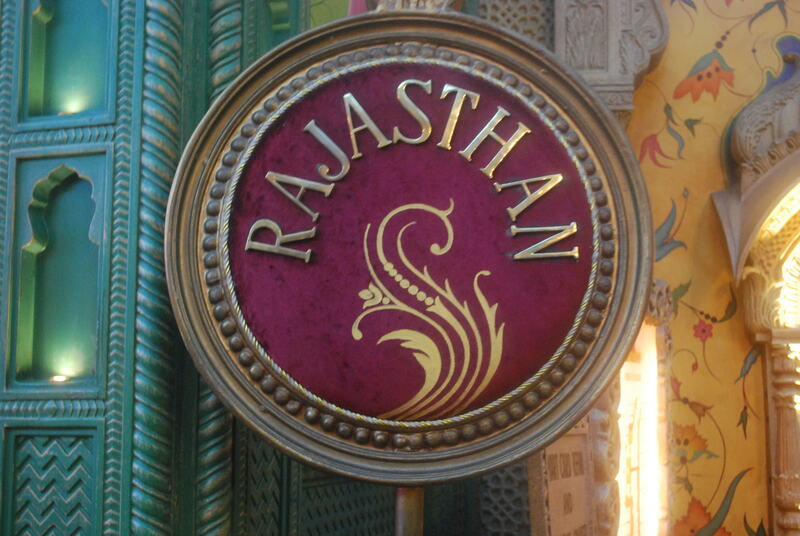 Once we had looked around, we went to the beautiful Rajasthan restaurant. This very charming Maharaj ji regaled us with his stories, and made us feel as though we were eating in a family home. The food, although vegetarian, was outstanding. This Raj Kachori was the best I’ve ever had. 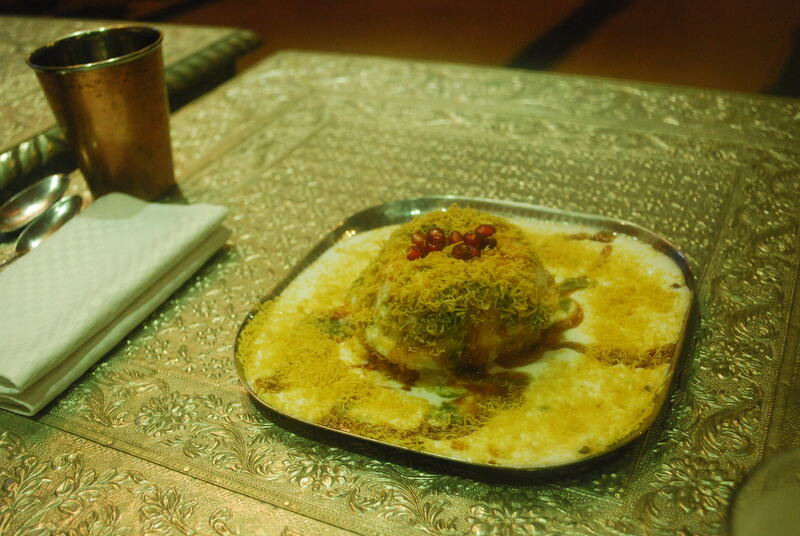 It was stuffed till it burst, and had a delicious sweetness from pomegranate seeds, crunch from the bhujia, and a silken creaminess from the yogurt. 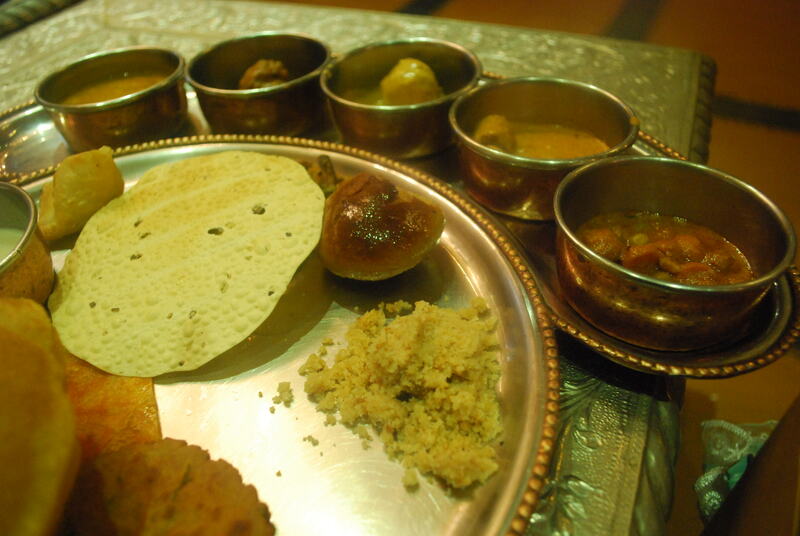 We also tasted the thali which was a mix of some traditional and some unsual Rajasthani offerings. 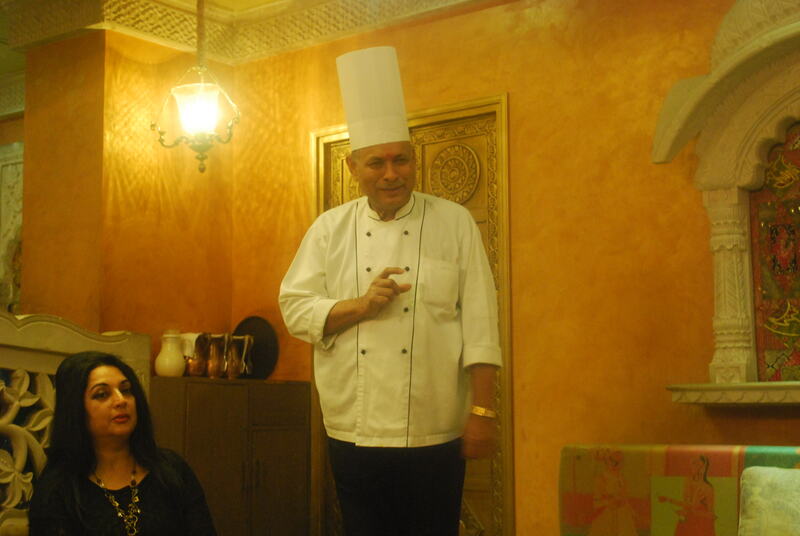 We were given advice on how best to enjoy every dish, what to mix it with, and which items to eat first. We were fed with not just the food, but with unbelievable amounts of care. That is what made it so very memorable. Stuffed till we could eat no more, we headed off to Nautanki Mahal, a venue for Bollywood style musicals and theatre. 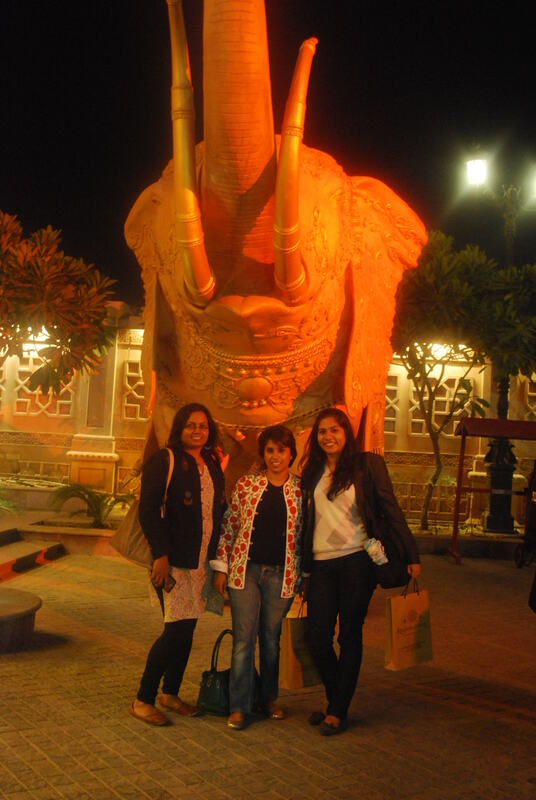 It was here that we watched Zangoora- The Gypsy prince – the most amazing Bollywood show ever. It had FANTASTIC dancing, beautiful costumes, and amazing sets. There were acrobats and hanging gliders and other magical stunts. The music was only popular Bollywood numbers and we couldn’t stop ourselves from singing along. Sushmita and I even got a chance to dance with some of the performers at the end of the show. 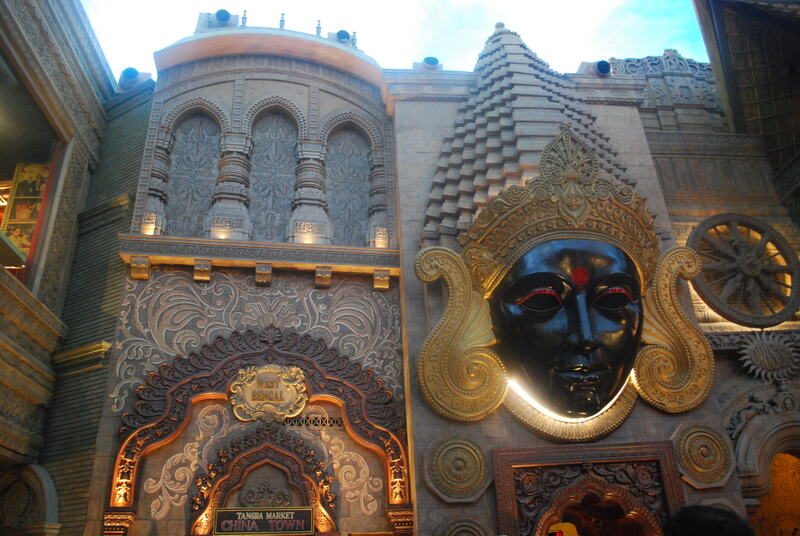 Kingdom of Dreams is a celebration of all things Indian. It is magical, colourful, musical, bright, delicious, and very, very happy making. We had an unbelievably fun day! Here’s a picture of some of us still grinning after the show. I went home feeling like child – with my hope in all things good, restored. Doesn’t this lion make you believe in magic? 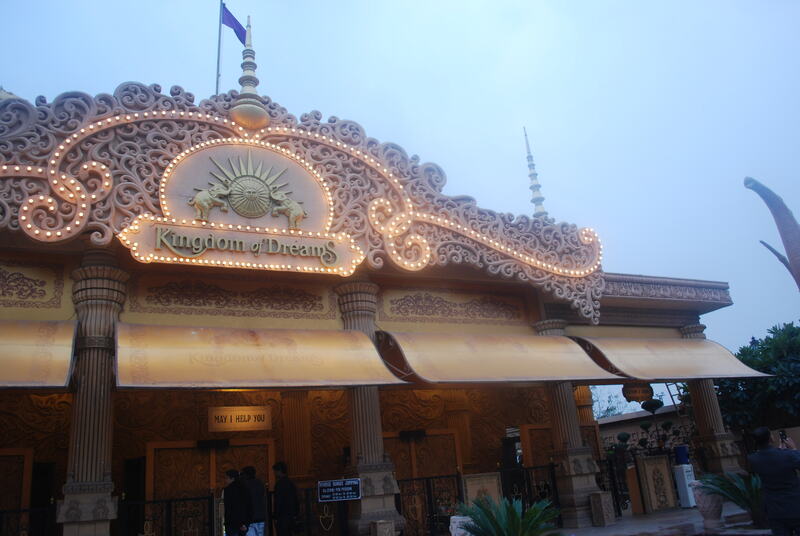 Head over to Kingdom of Dreams as soon as you can. I promise you’ll have the most memorable time. Thanks for sharing this blog. We Wanderlust ( http://adventuresportsindia.in/xtreme-adventures/ ), India’s Oldest & No.1 Adventure Sports Company, Was Set Up In 1987 By A Team Of Army Officers, Offering The Best Adventure Sports Experiences In India. With 9 National Awards Under Its Sleeves And 100% Safety Record, Wanderlust Pioneered & Brought Bungee Jumps From Germany In India In 1999. Very well narrated experience …I ws thinking tof explore this place and ur article made me so excited to go and have an wonderful experience …. No boday a one normal …all socket. 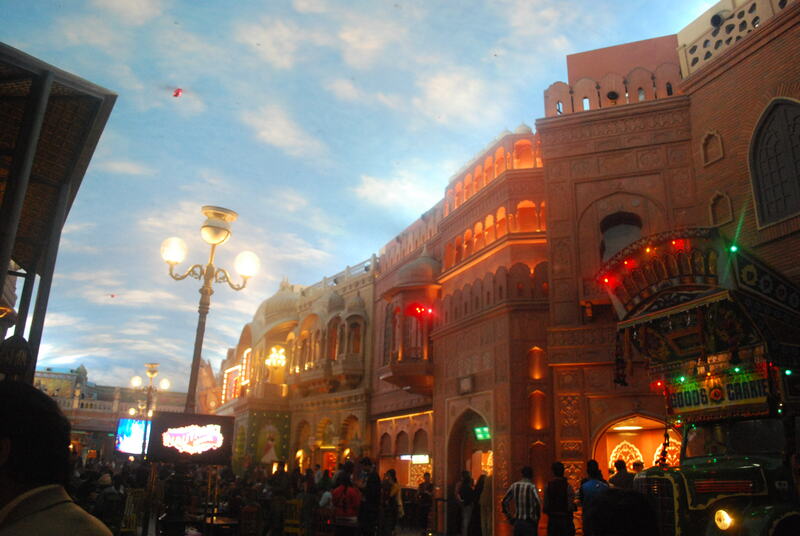 Kingdom of Dreams is a popular leisure destination located in Gurgaon. Thank you for mentioning about Cultural gully. I would like to add the kingdom of dreams culture gully tickets price 2016 for details. Yet to visit the place, planning to do so when I will be in Delhi in July. But, Must say you have written a brillient review of the place. Awesome way of describing. Wow! What a wonderful place. Very pretty. Woo. Lovely! Esp the food! That Rajkachori was something else..I almost finished it that day, that too when I don’t even like it much.